This entry was posted on August 4, 2018 by Mark Hutchby. A palette knife is a really essential artist painting tool for use with oil paint, acrylic paint or thick mediums. Giving you the ability to produce shape, texture or mixing of your acrylic paints or oil colour paint for all levels of artist. Most artists refer to any painting tool with a handle and blade shaped end as either palette knife or painting knives not really defining it true name or use. The main reason why there is confusion over the names is artists, as well as manufacturers, nowadays refer to all knives as palette knives or painting knives using the terms interchangeably. Palette knives get the name as they are used with artists palettes. Traditionally palette knives are designed to clean and scrape your artist palette so tend to have straight blade made from metal with a wooden handle or plastic with a flexible blade. The long straight blade or spatula can be used to mix your paint as well as scraping your palette clean. 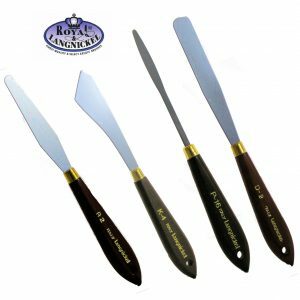 A painting knife is a very similar tool capable of producing a large range of textured effects in your artwork like impasto, fine lines and ridges or scraping off paint. 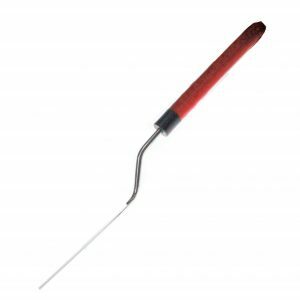 As painting knives are designed for applying the paint, strictly speaking a painting knife will have a crank handle. The idea or reasoning behind this is that it allows or aids the artists to avoid touching their painting whilst working. The knives come in a multitude of different shapes such as the teardrop, diamond, rectangle or spatula and mixtures of those. Painting knives that we sell normally have a metal blade that is semi-flexible with a wooden or soft grip handle, you are able to purchase plastic versions but we find that these are not as user-friendly you cannot get the details and the flexibility in the same way so we would always recommend you consider using metal. At the end of the day as long as it makes the mark you want it doesn’t matter whether it’s a painting knife or palette knife. We use all different painting knives or palette knives and have found most do the exact the same job and it’s impossible to distinguish between the two. Don’t restrict yourself to only using any tool with the mediums that are recommended, remember as Bob Ross used to say happy accidents happen, try and see what happens when you use it with other mediums such as watercolour or gouache. You just need a select one that suits the style of painting you are working to achieve. Most artists and manufacturers use both names to describe their products so we do refer to all knives as palette knives or painting knifes as manufactures have named them. 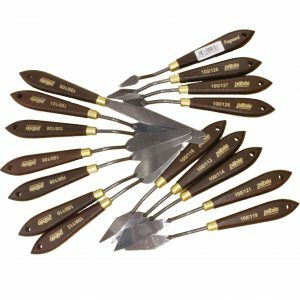 Click here to see our selection of palette and painting knives.